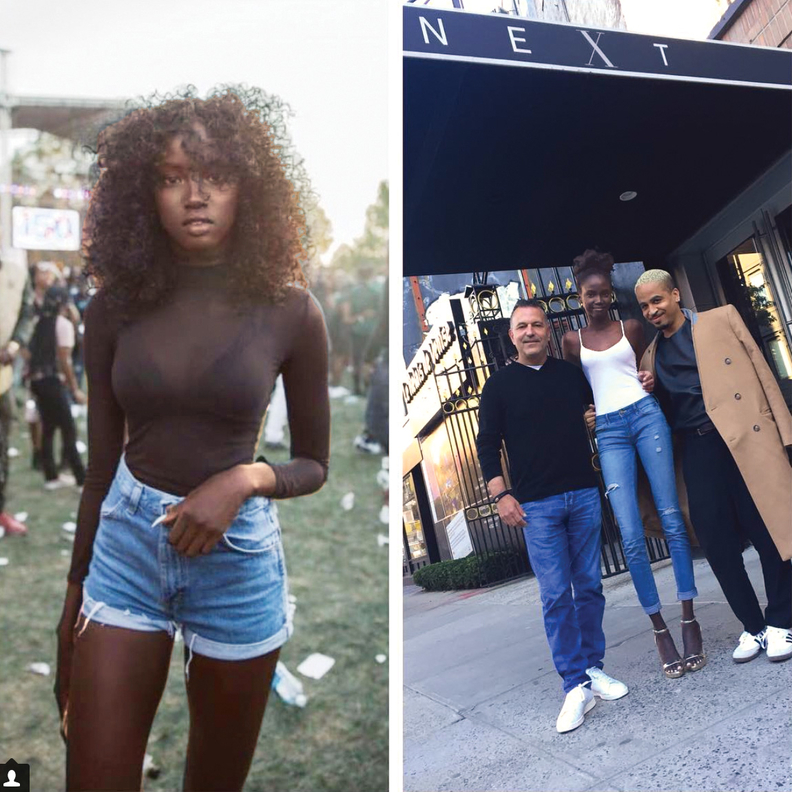 The photo that went viral, near right, helped Anok Yai get a modeling contract. She's seen celebrating the event, at far right. One day you're an aspiring physician, studying biochemistry as an undergrad. One Instagram post and a flurry of phone calls later, you're an internet sensation who's signed a contract with a top modeling agency. That's the story of Anok Yai, a 19-year-old sophomore from Plymouth (N.H.) State University, who had her picture snapped by photographer Steven Hall while attending an event at Howard University's homecoming Oct. 21. Yai thought the photo was just "average," she told the Boston Globe. But the picture went viral, gaining nearly 20,000 likes on the photographer's Instagram account, @thesunk. By Oct. 31, the striking Yai—born in Egypt to Sudanese parents who fled to the U.S. as refugees when she was 2—had signed a modeling contract with Next Management. While she had been fascinated by modeling as a child, watching "America's Next Top Model" with her sister and daydreaming about walking a Paris runway some day, Yai didn't think it would work out for her. "I always was inclined to do art and fashion, but I didn't know how to get into the industry," she told Vogue. Instead she went after another dream, attending college to study biochemistry with hopes of being a doctor. While pursuing medical school is on hold for now—her mother still wants her to return to college someday—and they've agreed that online classes are a compromise solution, according to the Washington Post. And she's serious about encouraging girls to study the sciences. "I definitely want girls to be looking into those (STEM) programs. Women aren't always raised to be as great as they can possibly be. They're told to care about more how they look and be extremely feminine. (So) science, math and technology are still considered male jobs," Yai told Vogue.